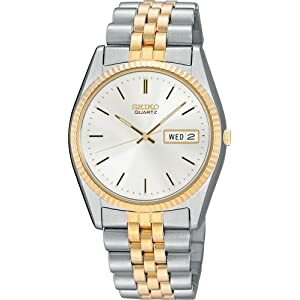 This watch has gold and silver tones, but is much bolder looking than other two-tone watches. One look and you either like it or you don't. It's stylish and grabs attention. The day and date are shown at the 3 position. No numbers on the watch, just lines for markings. The watch bezel and bracelet are both stainless steel. The bezel is gold toned and fluted, so it really stands out. Features hour, minute and second hands. The hour and minute hands glow in the dark, but the markings on the dial do not. The water resistance is only rated for 30 meters (99 feet), so play it safe and keep it dry.